I got my tonsils removed yesterday and it went really well. Kevin and I got to the surgical center and I changed into the beautiful hospital gown that everyone loves and then waited while they got everything ready. 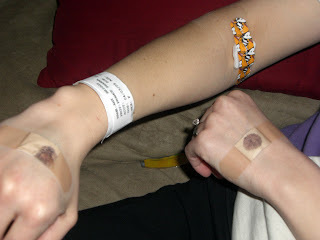 I was dreading the part where they have to stick the IV needle in me because that sort of thing makes me faint. So the nurse tried on one hand and she got it in, but then apparently they weren't quite ready for the IV, so she pulled it out and I started bleed a TON all over. It went all over my hand and the floor. I was already feeling light headed and that definitely didn't help... So then she came back and said she was going to try it on the other hand now. So she tried and tried and tried and tried.... for about 5 minutes she was digging around with the needle in my hand and I could hardly handle it. It hurt, but more than that it just grossed me out!! It was my worst nightmare coming true ha ha. Everything started to float away and I couldn't hear anything so I knew I was seconds from passing out. I said, "I'm really light headed..." and so she hurried and reclined the chair to I had my legs above my head. That brought me back pretty fast but then we still had to keep trying to get the needle in. 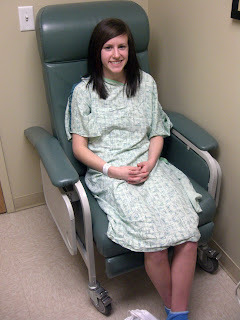 Kevin said I was greener than my hospital gown! The nurse was great and sooo nice and calm. It wasn't her fault, my veins were just not cooperating at all! She still couldn't get it in and so at that point she asked the anesthesiologist if he could try. He tried up by my elbow and got it in fairly quickly. That was such a relief to have that over with! The anesthesiologist was sooo awesome. He was joking with Kevin and I and when they wheeled me away to the surgery room, Kevin called out, "I love you" to me and I said it back at the same time the anesthesiologist said, "I love you too!" to Kevin, ha ha! Then the nurse and anesthesiologist were asking me about where I worked and that was the last thing I remember. Next thing I knew, I was waking up with a nurse asking me what pain level I was at. I couldn't talk because I had a mouth full of really thick spit, but I held up four fingers. She brought Kevin back and gave me an otter pop to water down the spit. Kevin's mom, Jeannine, came a couple minutes later. After I finished the otter pop, I felt nauseous and the nurse handed me a bag to throw up into. For me, throwing up is one of the worst feelings, but this actually felt so good. It was such a relief and after that, Kevin said I looked a ton better. I was kinda drifting in and out and at one point Kevin was stroking my face and hair. I turned to him and said, "your hands are so soft" and he was like, "I moisturize" the joke was lost on me, but Jeannine and the nurse thought it was funny :) So when I was awake enough, I changed back into my clothes and then we went home. I loved all the people down at the surgical center, they were all so nice and really made me feel so calm. On the way home, we had to stop at Wal Mart to fill my prescription for liquid Loritab, which I heard is DISGUSTING. We had them flavor it like watermelon though, and so far its been fine :) I slept most of the day yesterday and it was so nice. The pain isn't too bad because I'm on a strict pain med schedule every four hours and using ice packs. 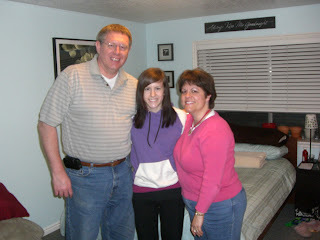 My mom and dad came up and visited me last night and it was so nice to sit and visit with them. I love hanging out with them. So far, things have been going very smoothly and I'm not feeling too bad. Kevin has been absolutely amazing. He is constantly asking me if he can get something for me and asking how I'm doing. He is such a sweetheart! I'm so lucky to have him! He took Monday off to spend with me too, so that will be nice. Hopefully the rest of my recovery goes as well as it has so far. I'm just glad to finally have those dang disgusting tonsils OUT! Before... ewww! Ouch!! That looks like it hurt. I'm glad to hear that the surgery went good. Its been a long time since I've seen you. Glad to see things are good for you!! Lovely graphics Amy. lol. Those are some awesome pictures. Man I am so glad it went well for you. I think it's easier when the patient actually wants pain meds and you don't have to torture them everytime you give it to them. Hopefully you like your meds I hated mine. Good luck. Oh and keep posting you go forever without posting. It's good to hear what you're up to. Oh man Amy...I am so sorry. I've heard that having your tonsils out when you're an adult is AWFUL. Hopefully you're on the mend and feeling much better! i hope you are doing better!!! those pics are awesomely disgusting! 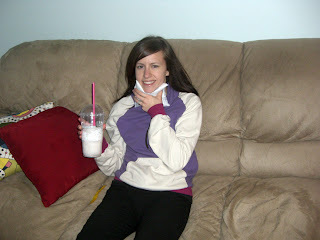 haha, i hope you are feeling better and i am glad that your tonsils are gone! I just had a tonsillectomy today, and felt like looking for other people that've had it done. Your tonsils looked exactly like mine(pretty much touching). I was told my Dr had never seen tonsils that big.. Obviously he hadn't met you..